With a successful pilot program initially running in 2015 (supported by Arts Queensland), this year has seen a 700% increase in student numbers participating in the program throughout the year. 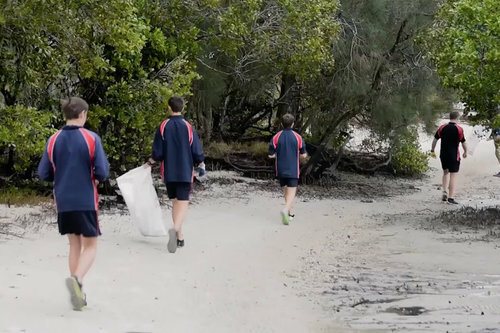 Collaboration with Five Oceans saw Year 9 students turning plastic waste found on the beach into upcycled products which were shipped to their customers. Participation with a real business, meant students got to collaborate and learn directly from local entrepreneurs as well as gaining strong insights into manufacturing during a visit to the Five Oceans factory. During the project, students also engaged with professional photographer Kiah Lucey, as well as the Clean Coast Collective. The Year 7 student's project saw them looking at ways to tackle waste and transform our relationship with food. In using design thinking, students researched the problem, made strong user observations, planted and took care of the school garden as well as engaging with technology to build smart plant monitors. Students also got a visit from QUT's Agbot II Designer Owen Bawden, who shared insights from their agriculture project as well as engaging students in a design challenge. After participating in a long term project to reduce food, water and e-waste, Year 8 students recently pitched their ideas with a number of great outcomes which could be developed further into the future. A variety of different prototypes were used throughout the development process to test ideas and were used to communicate during the presentations. Design students from both QUT and Griffith University visited the program throughout the year sharing their experiences and mentoring students during class time. Providing role models for the Jump Start students meant they were able to gain further clarity about their projects as well as getting a better understanding about tertiary education and their own personal aspirations. In June, the Jump Start program received a Good Design Australia Award which saw it recognised for it's innovative approach to design and entrepreneurship education and demonstrable positive impact for students. October saw Jump Start receive a visit from the Hon. Leeanne Enoch, Minister for Innovation. The Minister engaged with a number of staff and students, learning more about the program and projects within PSSC. Both quantitative and qualitative data has been used to measure the program's impact and has shown significant success in student results and engagement. We've ended the year by focussing efforts on further growth in 2017 to continue to maximise impact. We've also announced that the Jump Start program has partnered with PSSC and Seven Positive to create Fix-ed, a new Australian school led social enterprise giving people experiencing hardship a new lease on life. Fix-ed will launch at the beginning of 2017. Overall, the year has gone by in a flash and I'm confident that we'll continue to grow upon the Jump Start successes next year, in turn preparing high school students with the skills to thrive in the 21st Century. I'd like to thank PSSC Principal John Thornberry, HOD Adam Jefford and teachers Maygen Schwartz, Camilla White and Dwayne Scicluna for their valued support throughout the year.